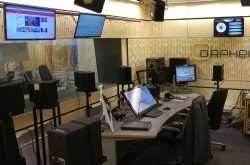 Digital audio files for broadcast are typically created to suit particular combinations of loudspeaker type and position. Performance may suffer if playback conditions do not match the intended combination. Nevertheless, current audio products allow very little customisation to suit equipment or personal preference. The EU-funded ORPHEUS project changed that. "Our consortium, which includes major European broadcasters," explains project leader Dr. Andreas Silzle, "created a set of new tools that cover the complete process of recording, producing and playing object-based audio (OBA)." For the user, OBA means no longer having to work with single unchangeable files. Instead, audio products contain numerous separate sound objects, plus metadata that describes the objects and their relationships. A playback device uses the information to optimally reproduce sound depending on its own capabilities, environmental conditions and user preferences. Two of the first key differences for users are interactivity and personalisation. For example, full written transcripts can be embedded within spoken programmes; in the case of long tracks, users are able to skim-read the content and skip directly to sections of interest. Users can also select among various languages. A further benefit is accessibility. Users can, for instance, selectively make speech louder and more distinct from background noise. Immersivity is another major feature of OBA. Users can switch on or off a binaural attribute that makes recorded music sound three dimensional like a live performance. "The 3-D-sound quality depends on the recording," says Dr. Silzle. "We use a spaced microphone tree, effectively a grid of 20 microphones at different heights and positions relative to the performers, plus separate microphones for each soloist." Each track is converted into a controllable sound object. A listener can potentially isolate one instrument, or singer, from a group of others. During two pilot stages, the research team demonstrated the effectiveness of the project's tools. Five of ORPHEUS' partner broadcasters used the tools to produce experimental radio-dramas intended to enhance listener experience. For instance, listeners may explore the story from various characters' perspectives. The content was encoded in MPEG-H format, which can be broadcast or streamed. Any MPEG-H-compatible computer or device can reproduce all OBA-embedded features. The ORPHEUS team also developed a suitable iOS app, which was validated by experts and end users. As a result of the trial programming and trade show demonstrations to industry professionals, the project has helped change traditional viewpoints about audio production. All broadcasters and streaming providers are potential users of OBA; furthermore, several broadcasters actively plan to begin using the ORPHEUS tools for production of interactive broadcast content. The team also produced technical guidelines for implementation – including reference architecture and source code for an OBA production renderer. Thanks to the ORPHEUS project, all necessary technical components for widespread adoption of OBA have come together. In a few years, interacting with audio material in the interactive style that OBA allows may become routine.